﻿ At home or away, keep your family healthy! At home or away, keep your family healthy! 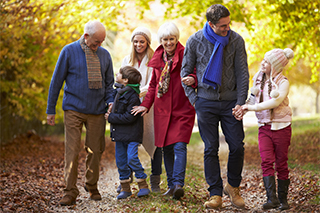 In autumn, Canadians begin to spend more time indoors – and this is when illnesses like influenza and pneumonia are most common and also easily spread, especially to people who have not been vaccinated. Who has greatest risk of flu complications? Seniors (especially nursing home residents), babies and toddlers, indigenous people, and people with chronic illnesses including heart disease, lung disease, stroke, immune-compromising and neurological conditions. Protect your family – for some, the flu can have serious consequences, such as pneumonia. Vaccinating the whole family helps protect those most likely to be hit hard. And bonus – when enough people in a community are immunized, everyone benefits from that “herd immunity” effect. Vaccination against the flu is advised for all Canadians over 6 months of age. People age 65 and over should be aware of two enhanced flu vaccines that provide increased protection compared with standard flu vaccines. One contains a higher dose of virus antigen, and the other contains the standard dose of antigen plus an added ingredient (adjuvant) that creates a stronger immune response to vaccination. This important innovation enhances protection for older adults, who produce 50 to 75 percent fewer antibodies in response to immunization than younger adults. Both enhanced vaccines are recommended for seniors as acceptable alternatives to the standard flu vaccine. If your family is getting away this flu season, make sure all of your vaccines are up to date. Don’t let your trip be ruined by traveller’s diarrhea – a greater risk in developing countries – or shingles, which causes a painful, often blistering rash and is more common in people over age 50. Travellers – especially children under age 5 and seniors over age 65 – may be at higher risk for pneumonia, especially if they spend time in crowded places or with children who have not received this vaccination. The pneumococcal vaccine is included in the routine immunizations given to children in Canada. A one-time shot is also recommended for seniors, and you can get it at the same time as your flu shot. Remember - some contagious illnesses rarely seen in Canada may be more common in other countries. A few vaccine-preventable illnesses reported in far-flung travel destinations during 2017 include measles, yellow fever, polio and cholera. You may also want to consider vaccinations to protect against hepatitis, meningococcal disease, human papilloma virus, typhoid, and tetanus. Visit Vaccines411 travel brochure page to assess your personal travel risks. Then, follow up with your travel vaccine clinic or healthcare provider at least 6 weeks before your departure to discuss your vaccine options. Here’s to safe and happy travels!